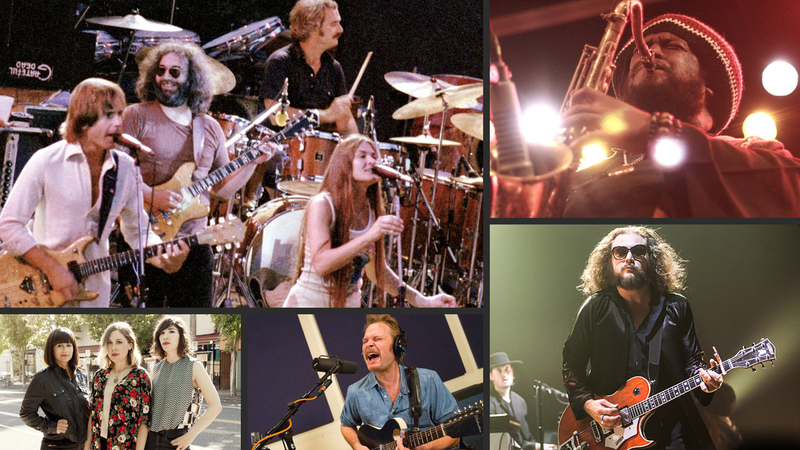 Weekend LISTening: 10 Bands Keeping The Grateful Dead Alive : World Cafe Consider yourself a Deadhead? Here's a list of contemporary artists that require your attention. Our guest on Friday's episode of World Cafe was Bob Weir, the founding rhythm guitarist of iconic American band the Grateful Dead. For five decades, Weir has carried the torch for his band, celebrating its legacy through repackaged deep dives into the archives as well as extensive tours with surviving members and new(-er) fans like John Mayer — who came on board for this summer's run of Dead and Company shows. This year, Weir set his sights elsewhere and released Blue Mountain, an album of countrified tunes that's the first solo outing under his own name since 1978. Following in step, we've also decided to look beyond the Dead for today's Weekend LISTening. As much as legions of Deadheads the world around might prefer to believe otherwise, the Grateful Dead is a thing of the past. It effectively ended in 1995 with the death of beloved bandleader Jerry Garcia. And the more time passes, the more Garcia and his music drift into the catacombs of memory. But that doesn't mean its spirit is gone. Beyond its own masterful recordings, the Grateful Dead was also an inspiration for legions of bands, carrying from its own generation to the next to the next. It goes without saying that this includes the global jam-band community, from Widespread Panic to Phish. But it's not limited to that scene either — something that was very evident in this year's Day of the Dead, a sprawling tribute compilation curated by Aaron and Bryce Dessner of The National that features artists ranging from Kurt Vile to Courtney Barnett. When the Dead launched in the Bay Area in '65, its members weren't emulating the biggest bands of their time. They were writing songs inspired by the music they loved, and finding ways through their playing and recording and collective group chemistry to make it new and interesting. Here are 10 contemporary artists making music in that spirit — if you consider yourself a Deadhead, they're required listening. Garcia and the Dead were true ambassadors for American roots music, from "Doin' That Rag" to "Ripple." That's exactly what San Francisco's M.C. Taylor of Hiss Golden Messenger has been doing for the past decade. On 2014's Lateness of Dancers, he finally started receiving widespread attention and acclaim, and on this year's Heart Like a Levee, his craft truly shines. On the surface, Warpaint might have more in common with '90s electronica a la Portishead, but the way this neo-psychedelic L.A. four-piece colors its music in a left-of-center style and creates stunning moods, particularly on this year's lively Heads Up, isn't too far off from Blues For Allah. The Dead parallel wasn't discussed much during this Philly band's formative years; critics seemed content to align Dr. Dog with The Beach Boys and The Beatles. But hey, this group has a Bobby in bassist Toby Leaman and a Jerry in guitarist Scott McMicken. Its songs talk about life and death and existential concerns. And it's got an ever-growing following of rabid fans who freak out at the chance to see the band live. The Olympia, Wash., power trio Sleater-Kinney got its start in the DIY punk-rock world. As such, I imagine the band might not appreciate being mentioned in the same breath as the Grateful Dead. But Corin Tucker, Carrie Brownstein and Janet Weiss have always been incredible players — and the more records they released, the less reserved they were about flexing their skill. 2005's The Woods — Sleater-Kinney's first for Sub Pop — was the most overt show of its shreddery, particularly the 11-minute epic "Let's Call It Love." If you have any passing interest in hearing world-class musicians jam, it's required listening. "15- to 20-minute songs that go to outer space and back" describes not only a great Dead bootleg but also great jazz albums. The Dead's work regularly utilizes the structure of jazz pieces, and Garcia's guitar playing was featured on Ornette Coleman's Virgin Beauty. Lately, Kamasi Washington has been on the lips of every jazz writer worldwide, and for good reason. 2015's The Epic is an intense album that should satisfy anyone hankering for a great cosmic experience. Matthew Houck, a.k.a. Phosphorescent, wrote "Song For Zula," which might just be the "Uncle John's Band" of this generation. It's heartfelt, sad, sentimental and something that makes for wonderful communal singalongs. In 1995, the New York City experimental band Sonic Youth closed its album Washing Machine with an elegant 20-minute piece called "The Diamond Sea," and jaded alt-rock dudes in usenet groups sneered "What is this, a Grateful Dead song?" Guitarist Lee Ranaldo probably didn't mind that comparison so much. Sonic Youth's members have since gone their separate ways, but Ranaldo continues making adventurous atmospheric music as a solo artist. Lest anybody doubt his fondness for the Dead, he was actively Instagramming from the Fare Thee Well shows in 2015. The musicians of jangly indie-rock favorite Real Estate don't immediately seem like Deadheads in their studio work, which recalls The Feelies more than Shakedown Street. Catch the band live, though, and its leanings come through in expansive jams. Real Estate covered "He's Gone" in concert when a San Francisco show lined up with Garcia's birthday, and its version of "Here Comes Sunshine" was featured on Day of the Dead. You'll also notice the parallel in this band's multiple leaders, whose various side projects definitely receive Dead checkmarks — from the spacey pop of Martin Courtney's solo outing Many Moons to the ramshackle folk of Alex Bleeker and the Freaks. Paloma Gil and Louise Hayat-Camard of The Dove & The Wolf started making music in their native Paris before migrating to the U.S., but the duo was clearly listening to the Grateful Dead early on. It's particularly evident in the intertwining space-rock guitars of "Green and Yellow" from last year's I Don't Know What To Feel EP — as well as in Gil and Hayat-Camard's delicate folksy harmonies, which contain echoes of "Rosemary." If you've seen any of these Louisville sons' massive guitars-on-guitars live sets over the past 18 years, there should be no doubt in your mind why MMJ is included on this list. If not, listen to "Lay Low" and we'll talk later.